May 2018: 'Scottish Slave-owners in Suriname: 1651–1863' in Northern Scotland, Volume 9. This is an account of Scots in the Dutch colony of Suriname from 1651 until the emancipation of slaves in the Dutch Empire in 1863, when Scottish owners of slaves received nine per cent of the compensation paid to slave-owners in the colony by the Dutch Government. Before 1790 the small Scots presence in Suriname was a product of the outward looking nature of the Dutch Atlantic and the willingness of some Scots, most with with family, religious or military ties to the Netherlands, to seize the opportunities this offered. After 1790 the British presence in Suriname expanded, with a significant involvement of Highland Scots who came to work new plantations in the colony from the neighbouring British controlled colonies of Berbice and Demerara. After the emancipation of slaves in the British Empire in 1834, a number of these Scottish slave-owners campaigned against emancipation in the Dutch Empire. Despite buying and selling slaves in breach of British law, and despite public criticism, none of these British-based slave-owners were prosecuted. The article concludes with an examination of the legacies of this Scottish slave-ownership, both in Scotland and in Suriname. 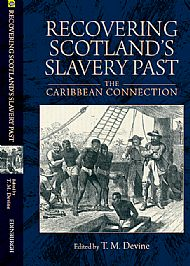 Tom M Devine (ed), Recovering Scotland's Slavery Past: The Caribbean Connection (EUP, 2015). 'Recovering Scotland's Slavery Past is an illuminating marvel. But the very fact that it illuminates is a measure of the darkness that prevailed until recently.' Ian Bell, Herald, 10 Oct 2015. My essay in this book: ‘The habits of these creatures in clinging one to the other': Enslaved Africans, Scots and the plantations of Guyana'. 'This pioneering volume also has a resonance far beyond slavery, underlining the impact of slavery on Scotland itself. Here is a book which ultimately demands a broader reappraisal of modern Scottish history.' James Walvin, author of Crossings: Africa, the Americas and the Atlantic Slave Trade. in Angela McCarthy & John Mackenzie (eds), Global Migrations: The Scottish Diaspora since 1600 (EUP, 2016): A tribute to Professor Sir Tom Devine, FBA, the leading historian of modern Scotland and its diaspora. David Alston, 'A Forgotten Diaspora: The Children of Enslaved and ‘Free Coloured’ Women and Highland Scots in Guyana Before Emancipation' in Northern Scotland, Volume 6, Issue 1, Page 49-69 available online from Edinburgh University Press.